Currently, several top vendors are seen using innovative materials for making basketball apparel with lightweight and breathable designs and other features. For instance, Nike offers basketball apparel and products that are made from incredibly flexible and soft Nike Therma Flex fabric. With such multi-featured products and product portfolio expansion, the vendors are continuously focusing on their pricing strategies. Cost optimization and portfolio innovation provide a competitive advantage to the vendors to optimize their bottom-line (profit) with an effective profit margin strategy. Therefore, all these innovative features are expected to increase the demand for basketball apparel during the forecast period. 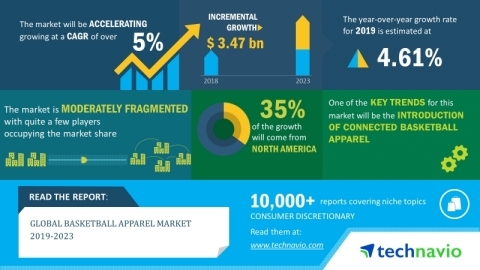 As per Technavio, the introduction of connected basketball apparel will have a positive impact on the market and contribute to its growth significantly over the forecast period. This global basketball apparel marketresearch report also analyzes other important trends and market drivers that will affect market growth over 2019-2023. The introduction of connected basketball clothing by vendors is trending in the global basketball apparel market. The growing technology innovations across the globe are encouraging the sports apparel manufacturers to introduce smart features in their products. Such innovations are expected to boost the overall growth for basketball apparel during the forecast period. "Apart from the introduction of connected basketball apparel, the increasing adoption of basketball, the introduction of various national and international basketball tournaments, increasing celebrity endorsements, and the expansion of online and offline distribution network are some other major aspects that are expected to drive the overall growth of the global market," says a senior analyst at Technavio. This market research report segments the global basketball apparel market by end-user (male and female), by distribution channel (online and offline) and geographical regions (North America, Europe, APAC, South America, and MEA). The North American region led the market in 2018, followed by Europe, APAC, South America, and MEA respectively. However, during the forecast period, the South American region is expected to witness the highest growth rate due to the presence of a large number of players in the region, which increases the demand for basketball apparel.